Each coffee-growing kit contained several African coffee seeds, which are prohibited from being imported into Hawaii. (Photo attached) HDOA has a long-standing quarantine which requires that coffee plants and seeds for propagation be held in quarantine by HDOA for a minimum of one year before being released for planting to help assure that the plants are not carrying any diseases or pests. In addition, to import coffee plants, plant parts including seeds or green beans and used coffee bags, require a permit and certification of specific quarantine treatment. Preliminary investigations indicate that one shipment of the kits, which are manufactured by Dunecraft Inc. in Ohio, arrived in Hawaii on June 19, 2017. HDOA is continuing to investigate how the kits were shipped to Hawaii. 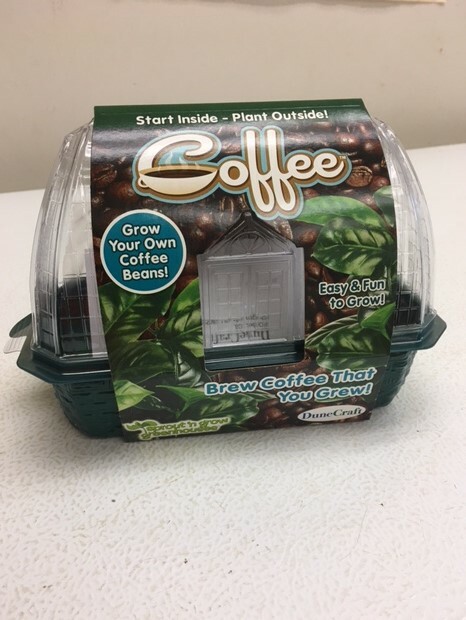 The coffee-growing kits were initially discovered by a customer on Kauai on Tuesday, June 27th, who saw the kits and knew that coffee plants and seeds were restricted in Hawaii. The customer contacted the University of Hawaii, who then referred the discovery to HDOA’s Plant Pest Control Branch on Kauai on June 28th. The Plant Quarantine was then notified and inspectors were dispatched to the retailer where 12 kits were immediately pulled from the shelves. HDOA’s Plant Quarantine Branch contacted Longs and was informed that each of the 42 stores were sent 12 kits each. Both the retailer and the product distributor were informed that the kits cannot be sold and have been very cooperative and complying with the entire process. Long’s has provided information that there are six kits that were sold on Kauai and three kits on Oahu that are currently not accounted for. (Update: one kit was also sold in Kona) If individuals have purchased a kit, they should keep it contained and contact HDOA as soon as possible at 643-PEST (7378) statewide, or the Oahu Plant Quarantine Branch at (808) 832-0566. “The consumer’s action to report this problem shows how the public plays a critical role in helping to protect Hawaii from agricultural and environmental pests,” said Scott Enright, chairperson of the Hawaii Board of Agriculture. “The Department relies on the efforts of its many partners in the state, federal and public sector to help address Hawaii’s biosecurity. Restrictions on coffee import were established to protect Hawaii’s major coffee industry from the introduction of diseases and pests from other areas of the world. The coffee berry borer, which has made its way to parts of Hawaii Island, Oahu and recently Maui, is native to Africa where there are other serious pests and diseases such as coffee rust. Due to the lack of a large coffee-growing industry on the U.S. Mainland, national coffee import rules are not as strict as Hawaii’s. “Even though a coffee seed may look clean on the surface, it may carry microscopic insect eggs, parasites and diseases that could be devastating to Hawaii’s coffee industry,” said Dr. John McHugh, administrator of HDOA’s Plant Industry Division. “The growing kits are a concern because the plants may eventually be planted outdoors and any associated insect pest or disease would be released into the environment. It is fortunate that these kits were discovered quickly. The seeds in all the kits will be destroyed by HDOA.